Layup — Knight’s Will Grant (1) goes up for a shot against Chaminade in the first round of the CIF-Southern Section Division 2AA playoffs on Friday. Grant scored 28 points, but the Hawks lost 76-61. Rejected — Knight’s Albert Ivy (3) slaps the ball away from Chaminade’s Gabe Boghossian (35) in a CIF-Southern Section Division 2AA first-round playoff game on Friday. PALMDALE — The fourth-quarter rally by the Knight boys basketball team ground to a halt with four minutes to play against Chaminade. The Hawks trailed by as many as 16 points, but cut the Chaminade lead to just three with four minutes and eight seconds remaining in the CIF-Southern Section Division 2AA first-round playoff game. That would be as close as Knight would get as Chaminade closed the game with a 12-0 run and score a 76-61 victory at Knight High on Friday night. “I feel like we gave it our all,” said Knight senior William Grant, who scored a team-high 28 points. “It wasn’t enough. Knight (19-9) trailed 49-33 in the third quarter, but rallied and cut the deficit against Chaminade (21-9) to three, 64-61 with 4:08 on a jumper by senior Raul Velarde. But the Hawks could get no closer. “They started to battle harder,” said Velarde, who scored a team-high seven points in the fourth quarter. “We started to lose a little bit of focus. Knight struggled against Chaminade junior center Abe Eagle, who at 6-foot, 10-inches, dominated the paint. Eagle scored four of his 32 points in the final two minutes. Knight was hampered defensively against Eagle by the absence of Knight senior forward Dajour Lewis, who missed the game due to a shoulder injury. Hegre said the shoulder injury has lingered for Lewis, but recently he couldn’t lift his arm. Although Knight effectively denied the ball to Eagle in the post with aggressive defense, sometimes double and triple teaming Eagle, the Chaminade big man dominated the glass. Eagle kept giving the Eagles second chances with rebounds and capitalizing with easy layups. “It was great teamwork,” Eagle said. “We worked hard. We came out a little flat. The two teams traded leads in the opening quarter, but Eagle grabbed a rebound and converted a layup to beat the first-quarter buzzer and give the Eagles a 23-22 lead. Chaminade extended that lead by outscoring Knight 18-11 in the second quarter. Eagle gave Chaminade a 27-24 lead by showing his range, sinking a jump shot from the free-throw line early in the quarter. Eagle gave the Eagles a 10-point lead, 34-24, with a rebound and layup. Chaminade took a 49-33 lead in the third quarter, but Knight began to chip away at that lead. Velarde cut the deficit to seven, 56-49, with one minute remaining in the third quarter when he hit a 3-pointer. Grant scored 11 points in the third quarter for the Hawks. Knight senior Demetrius Freeman hit a 3-pointer early in the fourth quarter to start the Hawks’ rally. Freeman finished with eight points and senior Albert Ivy added seven points. Velarde hit another three with 5:30 remaining in the game to cut the Eagles’ lead to 64-56 and with 4:57 left Eagle picked up his fourth foul and was forced to sit on the bench. Velarde made a layup, followed by his jumper with 4:08 left to cut the Chaminade lead to 64-61. 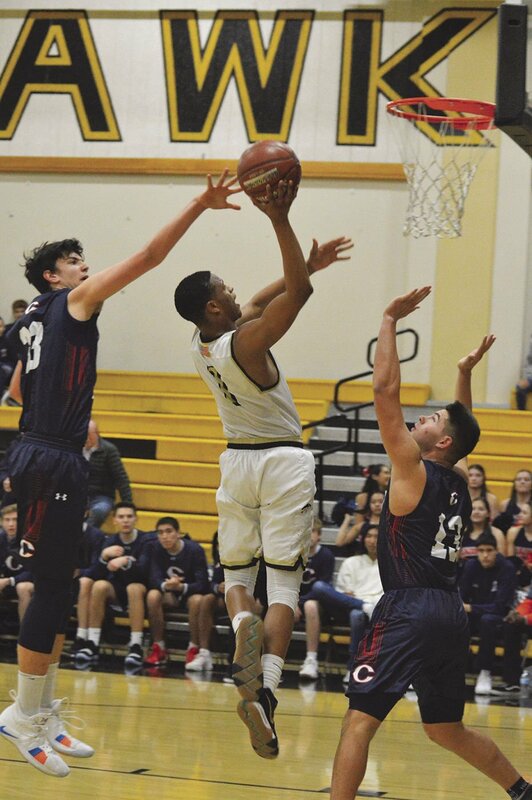 Knight was hoping to replicate its playoff success from last year, when the Hawks advanced to the Division 3AA championship game, losing to Crean Lutheran 62-61 in overtime. The Hawks followed that with two wins in the CIF State Division III playoffs, advancing to the Southern Regional Semifinals. “The bar just keeps getting raised higher here,” Hegre said. “It just becomes much tougher. “Whatever division they put you in, that’s the division of basketball we have to play,” Hegre said. “I think we played like a Division 2AA team tonight. Chaminade will face Notre Dame Riverside in the second round on Tuesday. Notre Dame, which beat Northwood 74-45 in the first round on Friday, won the Division 3A championship last season. Notre Dame eliminated Knight in the State playoffs and lost in the State championship game 70-65 to Pleasant Valley last year.